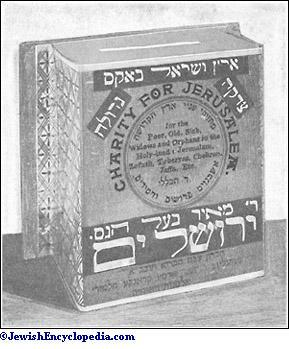 An organized collection of funds for distribution among the indigent Jews in the Holy Land, and for the aid of those who, moved by religious motives, desire to journey thither. Sympathizing coreligionists of almost every congregation in the "outland" ("ḥuẓ la-areẓ") form a standing committee, presided over by an officer variously called "gabbai," "amarkol," or "paḳid" (chief, governor, or appointee), under whose supervision collections in his city or district are made, the money being remitted by him semiannually to the proper "menahalim" (leaders) in Jerusalem, who distribute it among the needy—learned, elderly men, the destitute, and widows and orphans taking precedence. The history of the ḥaluḳḳah may perhaps be said to date back to the earliest rabbinical periods, when the academies in the Holy Land were supported mainly by voluntary contributions from congregations elsewhere, and by the fees received for decisions in Jewish civil suits and for the performance of religious offices. In the Middle Ages R. Jehiel (1257) transferred his yeshibah from Paris to Jerusalem. He was accompanied by his three hundred disciples, consisting of French and English Jews who had been maltreated in their native countries. But Jehiel and his pupils soon found themselves without means of support. Consequently he sent R. Jacob of Paris as a representative "meshullaḥ" (messenger) to solicit relief in Palestine and Turkey. R. Jacob appears to have been the first Palestinian meshullaḥ recorded, although the term "messenger of Zion" ("sheliaḥ Ẓiyyon")was applied in the period of the Amoraim (4th cent.) to R. Ḥama b. Ada (Beẓah 25b), who traveled between Babylon and Palestine delivering decisions and messages, and probably soliciting relief. Another early feature throwing light on the ḥaluḳḳah is the charity-box, the introduction of which, though attributed to R. Meïr Ba'al ha-Nes ("the miracle-worker"), was due to meshullaḥim, who toward the end of the seventeenth century used it for the collection of the ḥaluḳḳah fund; such boxes are placed in Orthodox Jewish dwellings and synagogues all the world over, and are stated to exceed 250,000 in number at the present time, all bearing the name of R. Meïr Ba'al ha-Nes. This R. Meïr, contrary to the popular notion, is not R. Meïr the Tanna, but R. Meïr ha-Ḳaẓin ("the chief"), whom R. Jacob of Paris, in describing his tomb at Tiberias, called "Ba'al ha-Nes." Under Egyptian rule the Jews of Palestine increased both in number and in prosperity. The ḥaluḳḳah contributions until the fifteenth century came mostly from Turkey, Egypt, and other countries in Asia and Africa. In the famine of 1441 the Jewish community of Jerusalem, probably for the first time, sent a meshullaḥ to European countries; the meshullaḥ's name was 'Esrim we-Arba'ah ("twenty-four")—a surname; not, as Grätz supposes, a title of honor indicating his knowledge of the twenty-four books of the Bible. The meshullaḥ was directed to go first to Constantinople, to obtain there the necessary credentials from the central committee headed by Moses Capsali, who, however, had to withhold his sanction, the war between Turkey and the Egyptian Mamelukes, who ruled Palestine, making the latter a belligerent state, the exportation of money to which was prohibited. Under the Ottomans in the sixteenth century the Jews of Palestine were settled mostly in Galilee, toward which there set a stream of exiles from Spain; and the ḥaluḳḳah contributions appear to have come in regularly without the intervention of meshullaḥim. About this time Joseph Caro of Safed established a precedent in Jewish charity-law, based on the verse, "If there be among you a poor man of one of thy brethren within any of thy gates in thy land," etc. (Deut. xv. 7). According to his interpretation, "thy gates" refers to the city of Jerusalem, and "thy land" to the Holy Land (Palestine), which, therefore, have a prior claim upon Jewish charity ("Bet Yosef" to Ṭur Yoreh De'ah. 251, 3); formerly it had been held that the passage referred to any residential city or adopted country (Sifre, Deut. 116 [ed. Friedmann, p. 98]). The reputation of Safed as the home of famous Talmudists and cabalists, including Caro and Luria, brought abundant support from abroad for scholars in the Holy Land. To provide for a permanent increase of the ḥaluḳ-ḳah, the communities of Palestine, early in the seventeenth century, adopted an ordinance ("taḳḳanah") invalidating any will not made in the presence of the parnas; this had the effect of reminding testators of their duty toward the community of Jerusalem (Lunez, "Jerusalem." ii. 87). Another taḳḳanah was afterward issued which practically amounted to a confiscation, for the benefit of the ḥaluḳḳah, of the chattels, money, and accounts of a deceased Jew who left no resident heirs. There were many evasions, and in several instances the well-to-do, before taking up their residence in the Holy Land, stipulated a certain sum which was to be paid to the community upon their death in place of the fulfilment of the decree. This so-called "inheritance tax" was strenuously opposed by the richer classes, and it was spasmodically abolished and reenacted. The income from this tax, however, never amounted to one-third of the ḥaluḳḳah, and to supply the deficiency there was no alternative but to resort to the meshullaḥim, who as a result became so numerous, and such frequent visitors in the European congregations, that they were regarded as wandering tramps, a nuisance and a reproach. Moses Ḥagiz, a typical meshullaḥ, in his "Sefat Emet" (Amsterdam, 1697), deplores the low estimate of the meshullaḥ entertained by the general public, and in reply to a Spanish contributor, (1) shows why the Holy Land is religiously superior to other countries, (2) urges the duty of settling there even prior to the fulfilment of the prophecies, (3) speaks of the calamities and tribulations of the Jews in Jerusalem, and (4) explains why the funds contributed in all parts of the world are insufficient. Referring to the meshullaḥim, he says: "They are sent abroad to acquaint our people in foreign countries of Jewish conditions in the Holy Land, and to enlist sympathy and support for the standard-bearers of the Tabernacle of God, who keep alive Jewish hopes and inspirations in the Land of Israel." He points out that the fact that "Christians will remit thousands of pounds annually for the maintenance of a Christian settlement is a challenge to the Jews who neglect to provide for the beloved sons of Zion." Ḥagiz estimated the appropriation of the ḥaluḳḳah for 1,500 souls in Palestine, including 1,000 in Jerusalem, to be 10,000 lire. Toward this sum there was an income from communal taxes of 2,000 lire; from legacies 2,000 lire; collected by meshullaḥim 2,000 lire; leaving a deficiency of 4,000 lire; Jewish indebtedness already amounted to sixty thousand "shekalim" (florins?). Ḥagiz was aware of the fact that the meshullaḥim were not liked, that they were abused no less than were the "ḥakamim" in Jerusalem, who were suspected and accused of "leading a luxurious life and spending the funds of the ḥaluḳḳah in drinking coffee and smoking tobacco." Nevertheless he was ready to state under oath that the ḥaluḳḳah barely supplied one-third of their actual necessaries of life. The main sources of the ḥaluḳḳah at that time in Europe were London, Amsterdam, Venice, and Leghorn. To meet the drain on the ḥaluḳḳah, the Jerusalem community borrowed from Gentiles at an enormous rate of interest, up to 45 per cent per annum, mortgaging their communal property; and when they failed to meet the obligations at maturity, the leaders of the congregation were imprisoned and held for ransom. 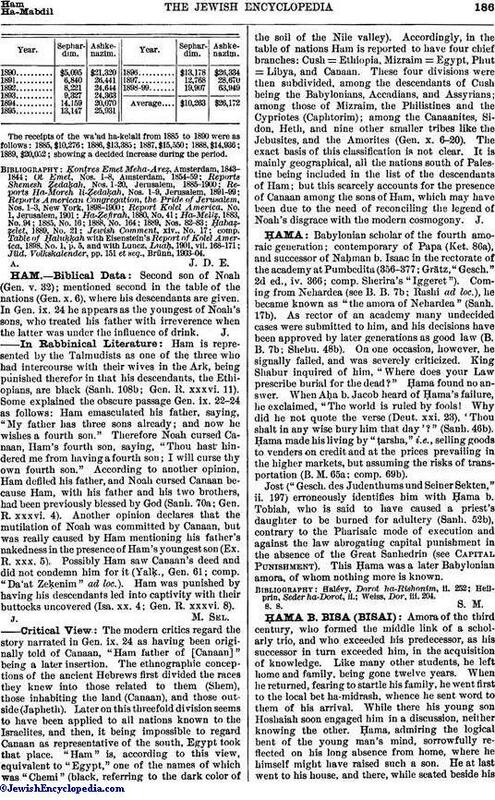 R. David Melammed, a meshullaḥ of Hebron, rendered a decision to the effect that inasmuch as the representative Jews of Hebronwere held under bail for taxes and other indebtedness of the community, they came under the category of "captives held for ransom," whose claims, therefore, took precedence over all other charitable matters having a special fund for disposal, and were not a perversion of charity (his responsa, in Ezekiel Silva's "Mayim Ḥayyim," Amsterdam, 1718). Till the middle of the eighteenth century the management of the ḥaluḳḳah was entirely in the hands of the Sephardim, who were classed as (1) rich or dependent on their own relatives, (2) working men and employees, and (3) ḥakamim and scholars of the yeshibot. The third class took one-third of the ḥaluḳḳah; one-third was appropriated for poor widows, orphans, and for temporary relief to helpless men; one-third was used in defraying the communal expenses. The distribution was made semiannually, before the Passover and the New-Year festivals. The meshullaḥim kept up their work in the Levant, in Italy, Germany, France, Holland, and England, with occasional visits to Russia, Poland, and America. A regular legal contract was drawn up between the community and the meshullaḥ. The community undertook to provide for the meshullaḥ's family during his absence and to advance his initial traveling expenses. The meshullaḥ on his part undertook to devote his attention and best endeavors to arousing the people by lectures, to urging the gabbaim to increase their remittances, and to opening up new sources of income. The commission was usually fixed at 45 per cent on all contributions coming direct from hiṃ or that were due to his influence, and 10 per cent on all income from his territory during the ten years following his return. It generally took the meshullaḥ from three to ten years or longer to complete his mission. In an important city he sometimes accepted a rabbinate or the position of a "maggid"-preacher, and held it for sometime. Occasionally he undertook the promotion of a business enterprise. He was also useful as a news-gatherer before newspapers came into existence. In short, the services of the average old-style meshullaḥim were distinctly valuable, in spite of the shortcomings of some among them who thought chiefly of personal gain, and cared little for the cause they represented. Pseudo-meshullaḥim, who represented no community, but traveled on their own behalf, also contributed largely to bring discredit upon the office and duty they had fraudulently assumed. Among the early meshullaḥim to America were R. Moses Malki of Safed, who visited the Newport congregation in 1759, and R. Samuel Cohen of Jerusalem (1775). An interesting meshullaḥ was Raphael Ḥayyim Isaac Carregal, of Hebron, who was in Newport in 1771 and 1773, after visiting the West Indies (Curaçao, 1764). These meshullaḥim are mentioned by Ezra Stiles in his Diary ("Publications Am. Jew. Hist. Soc." No. 10, pp. 18-32). Carregal refers to David Melammed as his teacher. The Ashkenazim at that time formed but a small minority of the Jewsih settlers in Palestine. 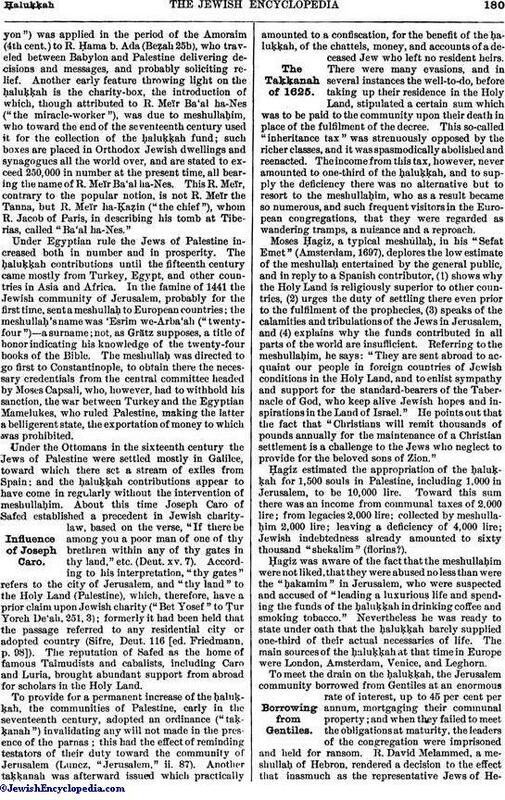 The efforts of Jehiel of Paris to maintain a yeshibah in Palestine in the thirteenth century, as already observed, had failed; and a second attempt, by R. Judah ha-Ḥasid of Siedlee, Poland, who with many followers emigrated to the Holy Land in 1701, was likewise futile. Not till the middle of the eighteenth century was the presence of the Ashkenazim felt. They came from the ranks of the Ḥasidim in Poland and South Russia; using the same liturgy and ritual as the Sephardim, they were easily assimilated with them, and received a share of the ḥaluḳḳah. The share, however, they asserted, was not in proportion to their numbers. They complained to the Ashkenazic gabbaim in Europe, and finally seceded from the Sephardim. With the aid of the Council of the Four Lands, they established headquarters for their separate ḥaluḳḳah at Lublin, Poland. Later, R. Abraham Gershon Kutawer, leader of the Ḥasidim in Hebron, sent meshullaḥhim to Metz and diverted the ḥaluḳḳah revenue from that source to his own section of the Holy Land. In a letter of Aryeh Judah Meisels of Apta, written in Jerusalem, the Ashkenazim accused the Sephardim of bad faith, declaring that, in spite of assurances to the contrary, the Ashkenazim were discriminated against and compelled to rely entirely upon their own resources (Luncz, "Jerusalem," ii. 148-157). While the Ashkenazim at Jerusalem and Hebron separated from the Sephardim and managed their own ḥaluḳḳah, the Ashkenazim at Safed were still united with the Sephardim and drew from the general ḥaluḳḳah, the headquarters for which were in Constantinople. 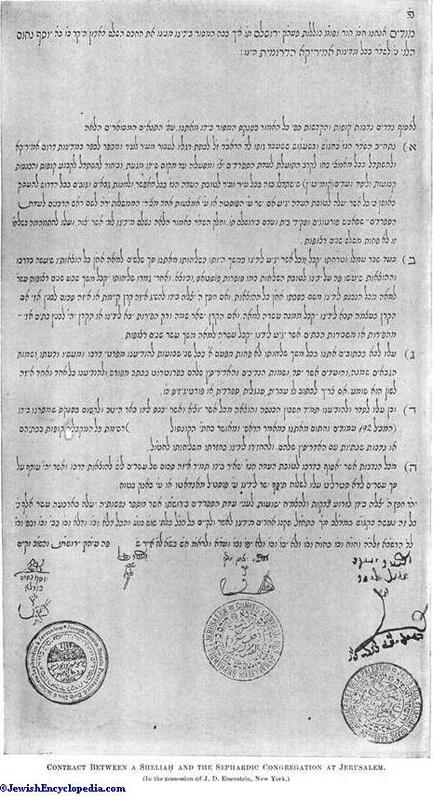 A letter dated 1778, and written from Safed by Israel Perez Polotzker to the gabbaim of Vitebsk, Russia, states that their meshullaḥim came to the house of Baruch Ananio, the head gabbai of the central committee at Constantinople, and received 3,000 lire. Out of this sum they paid 2,000 lire to the pasha for taxes and 250 lire for expenses of the meshullaḥim, the balance (750 lire) going to the ḥaluḳḳah (MS. in New York Public Library). In the credentials issued to R. Abraham ha-Kohen of Lask, a Jerusalem meshullaḥ sent to Poland in 1783, the Sephardic central committee writes that Ashkenazim in the Holy Land were taken care of and given a proportionate share of the ḥaluḳḳah (Schwarz, "Tebu'at ha-Areẓ"). A section of the Ḥasidim from South Russia settled in Tiberias. Their leader was R. Menahem Mendel of Vitebsk, who sent a meshullaḥ regularly to Poland and Volhynia, and in a businesslike manner rendered receipts for past donations signed by the leaders in Tiberias, with requests for further assistance. Contributions poured in, and the only difficulty experienced by the meshullaḥ was the safe delivery of the funds at Tiberias and Jerusalem, as the roads via Constantinople were infested by bands of robbers. He had to wait sometimes for three or four months for a protected vessel sailing from Constantinople to Haifa or Acre; and thence a safe-conduct with armed soldiers to Tiberias and Jerusalem was necessary. Meanwhile, the ḥaluḳḳah being exhausted, the Ḥasidim had to borrow money in anticipation of the next remittances. The requirements of the ḥaluḳḳah at that time exceeded 700 ducats ("Ḥibat ha-Areẓ," p. 61). A systematic propaganda for the ḥaluḳḳah was introduced by R. Abraham Kalisker, leader of the Ḥasidim in Tiberias. He secured the assistance of R. Mordecai of Niesvizh, who issued a proclamation, dated "22 Adar I., 5556 ," and addressed to all Jews of Poland, imploring every male and female, adult and minor, whether living in cities or villages, to subscribe a fixed sum every week for the support of their countrymen who had settled in the Holy Land. The amount was to be paid quarterly, in addition to special donations at weddings, circumcisions, and other religious rejoicings. This proclamation was approved by other rabbis in Poland, and the result was a substantial increase in the ḥaluḳḳah. Nowadays the ḥaluḳḳah is distributed among the four cities Jerusalem, Hebron, Tiberias, and Safed. The Perushim-Ashkenazim, coming from Lithuania, Russia, were then few in number and without organization in the Holy Land, and consequently were without an adequate share in the ḥaluḳḳah. R. Menahem Mendel and R. Israel, both of Shklov, together with twenty other Perushim (disciples of R. Elijah of Wilna) left Russia and settled in Safed in 1801. R. Israel, in order to establish a permanent income for the ḥaluḳḳah of the Perushim congregation, constituted himself the meshullaḥ for Lithuania and White Russia; he succeeded in his task (introduction to his "Pe'at ha-Shulḥan," Safed, 1837). The ḥaluḳḳah of the Perushim was increased by R. Aryeh Löb Katzenellenbogen of Brest-Litovsk and by Ḥayyim of Volozhin, who issued proclamations to the effect that the contributions put in the boxes bearing the name of R. Meïr Ba'al ha-Nes should not be used for candles in the synagogues, as was the custom in some cases, nor for any but the specific purpose of supporting the poor in the Holy Land. This movement tended to transfer all property rights in the Ba'al ha-Nes boxes to the ḥaluḳḳah fund. The headquarters for the ḥaluḳḳah of the Perushim were then removed from Shklov to Wilna. Similarly the headquarters of the rest of the Continent were removed from Metz to Amsterdam, where the central committee combined the ḥaluḳḳah interests of the Sephardim and Perushim (Luncz, "Jerusalem," ii. 148-157). After 1850 the Ashkenazic congregations, or "kolelim," at Jerusalem began to split into various sections, beginning with the Hollandish-German kolel, followed by the Warsaw and the Hungarian kolelim, until now there exist no less than twenty-five kolelim in Jerusalem. The motive for each separation has invariably been self-interest, to enlarge the ḥaluḳḳah portion of that particular kolel whose members are few in comparison with the contributions derived from their native land. It can not be denied, however, that the splitting up of the Ashkenazic community into many small congregation-groups has stimulated the tendency to home rule and aroused the spirit of emulation, and that the result has been greater economy, a more effective and energetic management, and a general increase of the ḥaluḳḳah. Some kolelim give certain of their beneficiaries an advance share over other members ("ḳedimah"), the privileged ones being men of learning and distinction. Children are generally allowed half a share. The share of an individual is sometimes mortgaged for several years in advance, the beneficiary assigning his right through a regular form of contract called "shi'bud," which is discounted at from 5 to 10 per cent, according to the reliability of the kolel which recognizes the assignment. The separation of the kolelim, each working for itself and managed by its own committee in Jerusalem, caused no little anxiety to those who had no kolel to care for them, as, for instance, those from foreign countries without a representative congregation in Palestine. The secession also gave the community much concern regarding general expenses, such as the salaries of the rabbis, the Turkish military taxes, and the usual bakshish to the Turkish officials. For these purposes the central committee, or "wa'ad ha-kelali," was organized in 1866 in Jerusalem by Rabbi Meïr Auerbach, who was succeeded by R. Samuel Salant in 1878. This committee represented the general interests of all the Ashkenazim in Palestine, while the Sephardim continued the management of their affairs under the guidance of the ḥakam bashi of Jerusalem. The wa'ad ha-kelali employed special meshullaḥim, whom they sent to countries without a representative kolel in Palestine. This plan resulted in opening up many new sources for the ḥaluḳḳah in South Africa, Australia, England, and particularly in America. Thus the meshullaḥim of the Sephardim found themselves in direct competition with the meshullaḥim of the Ashkenazim. The friction between the two sections increased their expenses and tended to lessen the revenue. 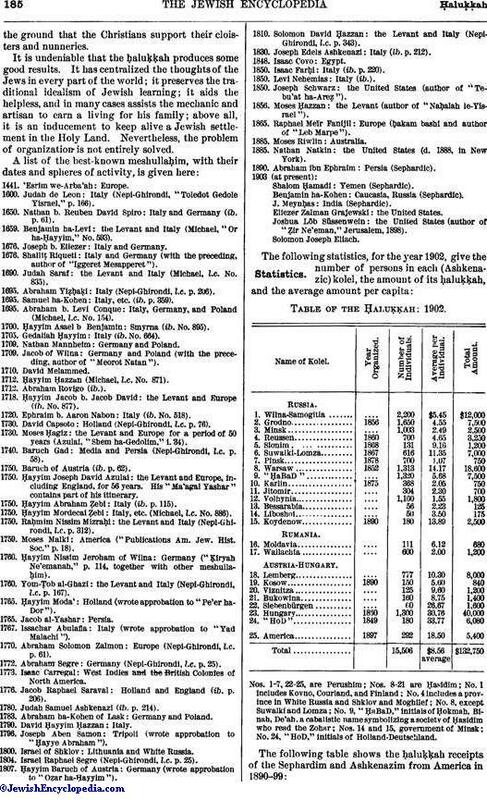 In 1871 the Sephardim and Ashkenazim compromised on the following basis of settlement regarding the American contributions: (1) Jerusalem to be the point for all remittances; (2) the Ashkenazim in Jerusalem to receive from the ḥaluḳḳah fund an advance of $500 per annum; (3) 15 per cent of the remainder to be advanced for the poor of both parties in Jerusalem; (4) the remainder to be divided: 60 per cent for both parties in Jerusalem and Hebron, and 40 per cent to Safed and Tiberias. The distribution by the central committee, irrespective of the kolel afliliations, is known as the "minor ḥaluḳḳah "("ḥaluḳḳah ḳeṭannah"), and averages about one dollar per person. 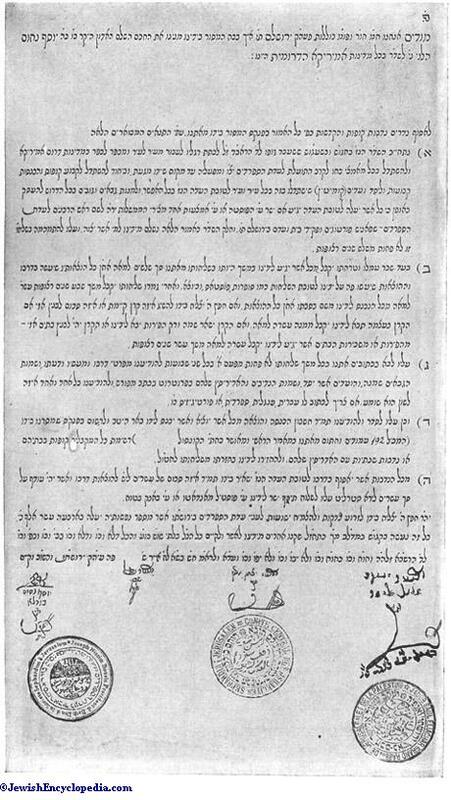 Contract Between a Sheliaḥ and the Sephardic Congregation at Jerusalem. R. Joseph Riwlin, as secretary of the central committee, reorganized it in 1885, introduced a modern system of bookkeeping, and issued printed reports of the receipts and expenditures of the ḥaluḳḳah, thus coming into touch with the gabbaim and the contributors. These reports, known as "shemesh ẓedaḳah" (the sun of righteousness), contain items of history relative to almost every country in the world. At the time of the earliest reports the contributions intended for division between the Sephardim and the Ashkenazim were usually sent to Nathan Marcus Adler, chief rabbi of England, who forwarded the proper amounts to the ḥakam bashi, Raphael Meïr Fanijil, and R. Samuel Salant, in Jerusalem. The North-American Relief Society for the indigent Jews of Jerusalem, whose members were Portuguese and German Jews, sent about $750 per annum through the chief rabbi of England, with instructions to divide the amount between the two parties. Contributions intended for Ashkenazim only were sent to R. Samuel Salant. The New York Society for the Relief of the Poor in Palestine forwarded to him about $1,250 yearly. Baltimore was the next best center, sending about $500 yearly through the congregations Chizuk Emoonah and Shearith Israel. Altogether the American contributions to the ḥaluḳḳah did not exceed $5,000 per annum up to 1885. But through the energetic work of Riwlin the increase of the Ashkenazic ḥaluḳḳah from America was soon apparent, and was largely due to the reports and the activity of the meshullaḥim, who covered every state from Maine to California. 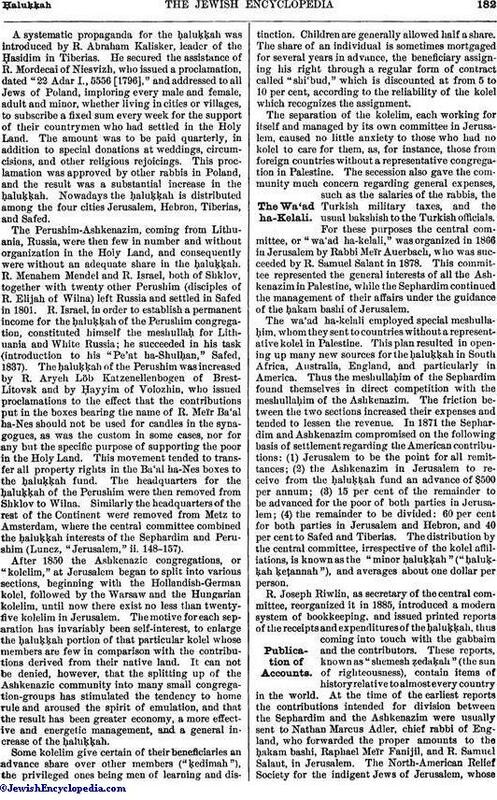 The agreement of 1871 with the Sephardim had become obsolete by that time, and to strengthen their position in America the Sephardim, following the example of their opponents, began to issue, in 1891, similar reports, entitled "Ha-Morch li-Ẓedaḳah" (The Guide for Charity). The Sephardim, tired of opposing the Ashkenazim in North America, retired, and confined their attention to Italy, the Barbary States, Turkey, Egypt, Yemen, Persia, India, Turkestan, etc. The result was that the two factions entirely separated as regards the haluḳḳah, each working in its own sphere. The American Jews in Palestine, following the examples of the other kolelim, strove to organize their own kolel. J. G. Wilson, the United States consul at Jerusalem, in his approval of the project dated Feb. 10, 1879, said that "a responsible agency for the distribution of their charities may be the means of great and lasting good," and promised cooperation to the best of his power. But the central committee would not allow this new kolel to exist, and, instead, satisfied the few American claimants for assistance. 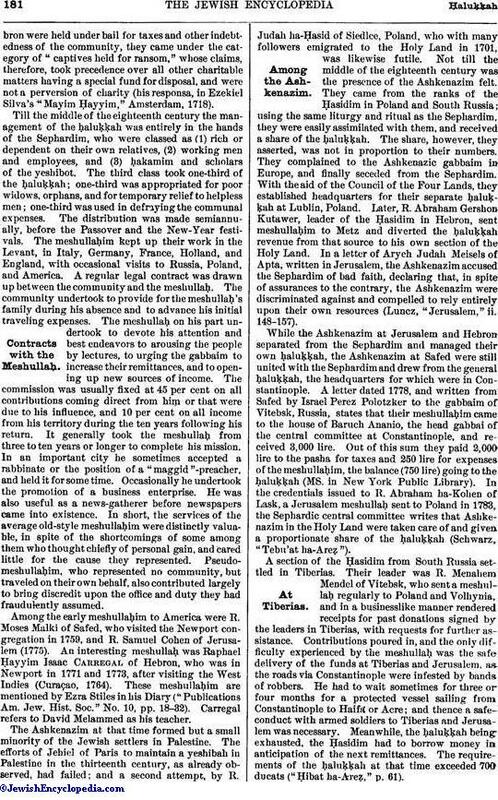 After several other attempts the Americans finally succeeded in organizing their kolel (Aug., 1895), and induced Rabbi Joshua Löb Diskin in Jerusalem to accept their rabbinate and to receive all contributions for the American kolel. The members in New York contributing to the American kolel were incorporated Dec. 17, 1897, as "The American Congregation, the Pride of Jerusalem." The receipts were, in 1898, $943; in 1899, $1,255; in 1900, $1,762. 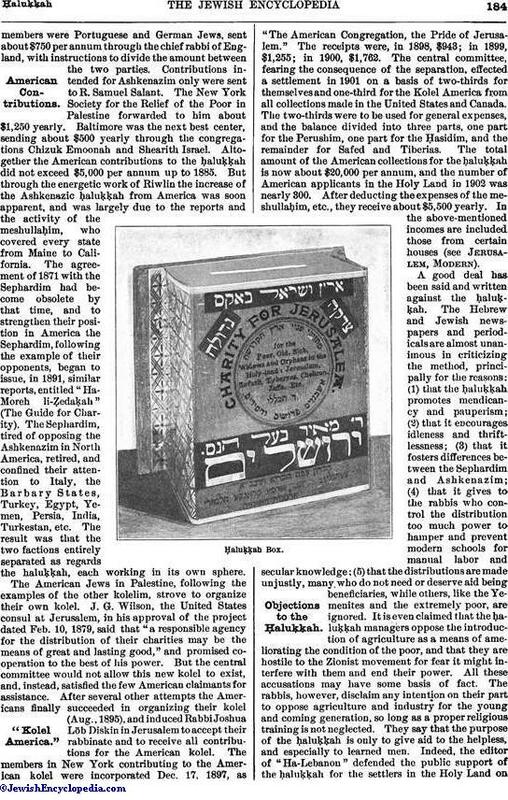 The central committee, fearing the consequence of the separation, effected a settlement in 1901 on a basis of two-thirds for themselves and one-third for the Kolel America from all collections made in the United States and Canada. The two-thirds were to be used for general expenses, and the balance divided into three parts, one part for the Perushim, one part for the Ḥasidim, and the remainder for Safed and Tiberias. The total amount of the American collections for the ḥaluḳḳah is now about $20,000 per annum, and the number of American applicants in the Holy Land in 1902 was nearly 300. After deducting the expenses of the meshullaḥim, etc., they receive about $5,500 yearly. In the above-mentioned incomes are included those from certain houses (see Jerusalem, Modern). A good deal has been said and written against the ḥaluḳḳah. 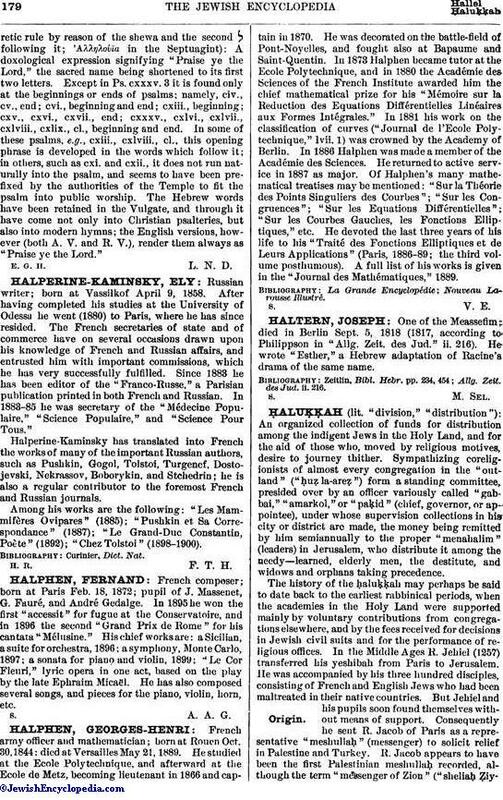 The Hebrew and Jewish newspapers and periodicals are almost unanimous in criticizing the method, principally for the reasons: (1) that the ḥaluḳḳah promotes mendicancy and pauperism; (2) that it encourages idleness and thriftlessness; (3) that it fosters differences between the Sephardim and Ashkenazim; (4) that it gives to the rabbis who control the distribution too much power to hamper and prevent modern schools for manual labor and secular knowledge; (5) that the distributions are made unjustly, many who do not need or deserve aid being beneficiaries, while others, like the Yemenites and the extremely poor, are ignored. It is even claimed that the ḥaluḳḳah managers oppose the introduction of agriculture as a means of ameliorating the condition of the poor, and that they are hostile to the Zionist movement for fear it might interfere with them and end their power. All these accusations may have some basis of fact. The rabbis, however, disclaim any intention on their part to oppose agriculture and industry for the young and coming generation, so long as a proper religious training is not neglected. They say that the purpose of the ḥaluḳḳah is only to give aid to the helpless, and especially to learned men. Indeed, the editor of "Ha-Lebanon" defended the public support of the ḥaluḳḳah for the settlers in the Holy Land onthe ground that the Christians support their cloisters and nunneries. It is undeniable that the ḥaluḳḳah produces some good results. It has centralized the thoughts of the Jews in every part of the world; it preserves the traditional idealism of Jewish learning; it aids the helpless, and in many cases assists the mechanic and artisan to earn a living for his family; above all, it is an inducement to keep alive a Jewish settlement in the Holy Land. Nevertheless, the problem of organization is not entirely solved. 1600. Judah de Leon: Italy (Nepi-Ghirondi, "Toledot Gedole Yisrael." p. 166). 1650. Nathan b. Reuben David Spiro: Italy and Germany (ib. p. 61). 1659. Benjamin ha-Levi: the Levant and Italy (Michael, "Or ha-Ḥayyim," No. 593). 1676. Joseph b. Eliezer: Italy and Germany. 1676. Shalliṭ Riqueti: Italy and Germany (with the preceding, author of "Iggeret Mesapperet"). 1690. Judah Saraf: the Levant and Italy (Michael, l.c. No. 835). 1695. Abraham Yiẓḥaḳi: Italy (Nepi-Ghirondi, l.c. p. 206). 1695. Samuel ha-Kohen: Italy, etc. (ib. p. 359). 1695. Abraham b. Levi Conque: Italy, Germany, and Poland (Michael, l.c. No. 154). 1700. Ḥayyim Asael b. Benjamin: Smyrna (ib. No. 895). 1705. Gedaliah Ḥayyim: Italy (ib. No. 664). 1709. Nathan Mannheim: Germany and Poland. 1709. Jacob of Wilna: Germany and Poland (with the preceding, author of "Meorot Natan"). 1712. Ḥayyim Ḥazzan (Michael, l.c. No. 871). 1718. Ḥayyim Jacob b. Jacob David: the Levant and Europe (ib. No. 877). 1720. Ephraim b. Aaron Nabon: Italy (ib. No. 518). 1730. David Capsoto: Holland (Nepi-Ghirondi. l.c. p. 76). 1730. Moses Ḥagiz: the Levant and Europe for a period of 50 years (Azulai. "Shem. ha-Gedolim," i. 34). 1740. Baruch Gad: Media and Persia (Nepi-Ghirondi, l.c. p. 58). 1750. Baruch of Austria (ib. p. 62). 1750. Ḥayyim Joseph David Azulai: the Levant and Europe, including England, for 56 years. His "Ma'agal Yashar" contains part of his itinerary. 1750. Ḥayyim Abraham Ẓebi: Italy (ib. p. 115). 1750. Ḥayyim Mordecai Ẓebi: Italy, etc. (Michael, l.c. No. 886). 1750. Raḥmim Nissim Mizraḥi: the Levant and Italy (Nepi-Ghirondi, l.c. p. 312). 1759. Moses Malki: America ("Publications Am. Jew. Hist. Soc." p. 18). 1760. Ḥayyim Nissim Jeroham of Wilna: Germany ("Ḳiryah Ne'emanah," p. 114, together with other meshullaḥim). 1760. Yom-Ṭob al-Ghazi: the Levant and Italy (Nepi-Ghirondi, l.c. p. 167). 1765. Ḥayyim Moda': Holland (wrote approbation to "Pe'er haDor"). 1767. Issachar Abulafia: Italy (wrote approbation to "Yad Malachi"). 1770. Abraham Solomon Zalmon: Europe (Nepi-Ghirondi, l.c. p. 61). 1772. Abraham Segre: Germany (Nepi-Ghirondi, l.c. p. 25). 1773. Isaac Carregal: West Indies and the British Colonies of North America. 1776. Jacob Raphael Saraval: Holland and England (ib. p. 206). 1780. Judah Samuel Ashkenazi (ib. p. 214). 1783. Abraham ha-Kohen of Lask: Germany and Poland. 1790. David Ḥayyim Ḥazzan: Italy. 1796. Joseph Aben Samon: Tripoli (wrote approbation to "Ḥayye Abraham"). 1800. Israel of Shklov: Lithuania and White Russia. 1804. Israel Raphael Segre (Nepi-Ghirondi, l.c. p. 25). 1807. Ḥayyim Baruch of Austria: Germany (wrote approbation to "Oẓar ha-Ḥayyim"). 1810. Solomon David Ḥazzan: the Levant and Italy (Nepi-Ghirondi, l.c. p. 343). 1830. Joseph Edels Ashkenazi: Italy (ib. p. 212). 1850. Isaac Farḥi: Italy (ib. p. 220). 1850. Levi Nehemias: Italy (ib.). 1850. Joseph Schwarz: the United States (author of "Tebu'at ha-Areẓ"). 1856. Moses Ḥazzan: the Levant (author of "Naḥalah le-Yisrael"). 1865. Raphael Meïr Fanijil: Europe (ḥakam bashi and author of "Leb Marpe"). 1885. Nathan Natkin: the United States (d. 1888, in New York). 1890. Abraham ibn Ephraim: Persia (Sephardic). 1903 (at present):Shalom Ḥamadi: Yemen (Sephardic).Benjamin ha-Kohen: Caucasia, Russia (Sephardic).J. Meynḥas: India (Sephardic).Eliezer Zalman Grajewski: the United States.Joshua Löb Süssenwein: the United States (author of "Ẓir Ne'eman," Jerusalem, 1898).Solomon Joseph Eliach. Table of the Ḥaluḳḳah: 1902. Nos. 1-7, 22-25, are Perushim; Nos. 8-21 are Ḥasidim; No. 1 includes Kovno, Courland, and Finland; No. 4 includes a province in White Russia and Shklov and Moghilef; No. 8, except Suwalki and Lomza; No. 9, "ḤaBaD, "initials of Ḥokmah, Binah, De'ah, a cabalistic name symbolizing a society of Ḥasidim who read the Zohar; Nos. 14 and 15, government of Minsk; No. 24, "HoD," initials of Holland-Deutschland. The receipts of the wa'ad ha-kelali from 1885 to 1890 were as follows: 1885, $10,276; 1886, $13,385; 1887, $15,550; 1888, $14,936; 1889, $20,052; showing a decided increase during the period. Jüd. Volkskalender, pp. 151 et seq., Brünn, 1903-04.